From May to September of each year Island Princess explores the straights and fjords of Alaska. These cruises depart from either Vancouver or Anchorage and spend the majority of the season cruising one way between the two cities. As the weather cools, Island Princess makes her way down the US Pacific Coast to Los Angeles, starting a season of bucket-list Panama Canal cruising. You have a couple of options when it comes to the Panama canal – you can complete a roundtrip cruise from either Los Angeles or Fort Lauderdale which will complete a partial transit of the canal, or you can do a Transcanal cruise where you will complete the full canal crossing from ocean to ocean. 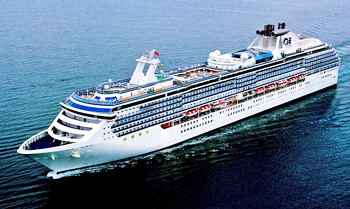 View all Island Princess cruises, view a selection of Princess cruise deals, or view more options for Princess cruises. Island Princess is your own private retreat on the sea. Whether you crave relaxation or exhilaration, you’ll find the soothing Lotus Spa, live entertainment, gourmet cuisine, casino gaming and more. And for a special treat, try the Bayou Cafe and Steakhouse, which features New Orleans-inspired Cajun and Creole cuisine. Leave it to Princess to create experiences the whole family can enjoy. The destinations we visit come to life with our Festivals of the World celebrations and Discovery at Sea programs like Shark Week. If you’re looking for some friendly competition there’s Wii family tournaments, indoor and outdoor sports, and The Voice of the Ocean, our high-seas version of the TV singing sensation where guests choose the winner. Princess makes it easy to sail together in comfort. There is a wide selection of staterooms accommodating up to four guests, and you’ll enjoy substantial savings on your third and fourth guests. There are also connecting stateroom options, as well as Family Suites, with room for up to eight guests, which offer more living space, a balcony and two bathrooms, including a full bath tub.